Christopher Columbus left on his third expedition on May 30, 1498, soon after John Cabot’s five ships headed west to the newly found land. Before we tell you the story, we need to catch you up on a few things. Two years earlier, March 10, 1496 [about the time Cabot was on his first trip to Newfoundland] Columbus left La Isabella in his makeshift vessel, the India(1). He arrived in Cadiz, Spain, on June 11, three months later. Juan de Aguado, who had sailed to Española with the supply fleet that was wrecked in the hurricane, returned to Spain at the same time on the Niña. Between the two of them, they carried over two hundred unhappy and windblown colonists. It took Columbus a year to talk the Spanish sovereigns into allowing him to return to his empire. Ferdinand and Isabella were so fed up with his lies and false promises that they would have abandoned him if they could have. However, no other explorer had stepped forward to take advantage of their New Permissions. The New Permissions disqualified foreigners like John Cabot and Martin Behaim from obtaining patents. And the only person willing to finance such risky ventures had been Giannotto Berardi, and he was dead. So, in April of 1497, the Catholic Monarchs designed a new scheme. Based on reports of gold mines in Española, they allowed Columbus to continue as Admiral of the Ocean Sea. They promoted Bartolomé, who was still in Española, to the position of Lieutenant Governor. They ordered the brothers to convert the Traíno Arawaks to Christianity, not enslave them. And they specified that a new town be built on the south side of Española at Rio Haina, where the supposed gold mines lay. Needing a workforce, they told Columbus to round up Spain’s criminals and street thugs and exchange pardons for work. He was to trade death penalties for two years of service, and lesser penalties for one year of service(2). The Admiral could also draft minor criminals who had been exiled to other islands, or sent to work camps, or were serving time in mines. Colonists could no longer seek gold for themselves or keep percentages of their profits. Everyone was required to report to the Columbus brothers and follow their bidding. The monarchs sent Captain Antonio de Torres to Española with ships carrying needed supplies. When they arrived, Lieutenant Governor Bartolomé Columbus began building today’s Santo Domingo, the oldest surviving colony in the Americas. Over time, colonists would abandon La Isabella, the first official new settlement, if you do not count La Navidad. Today, all that is left of the town are European graves, Indian caves in the mountains, and fifteenth century cannon barrels and anchors buried under the silt in the bay. Columbus would stay in Spain until May 30, 1498, sorting out his affairs. That meant a lot of time passed without the Spanish following up on their new discoveries. Part of the delay was that Ferdinand and Isabella needed to deal with the death of their son, Juan, in October of 1497. In the meantime, on August 6 of that year John Cabot had returned to Bristol, completing his second voyage. By the end of 1497, Admiral Columbus was finally back to planning. About that time Columbus received the letter from the English merchant Hugh Say,(3) written under the alias John Day, that we quoted earlier. Say drafted the letter in Bristol during the winter of 1497 to 1498, after John Cabot returned from his second trip, but before Cabot departed on his third trip. Hugh Say referenced two travelogues that would greatly influence how Columbus planned his third expedition. First, he wrote that he was sending Columbus a copy of The Travels of Marco Polo(4). This was probably not the copy that is now in the Colón Museum in Seville with Columbus’ scribbles in the margins. [The scribbles related to earlier voyages.] Second, Say wrote that he was sorry he could not find his copy of Inventio Fortunatae, which he apparently wanted to send as well.We know that Christopher would follow some of the geographic information from that book because both Bartolomé de Las Casas and Ferdinand Columbus told us so in their biographies on the Admiral. We discussed Inventio Fortunatae in our article about Travelogues. Martin Behaim referenced it on his globe. 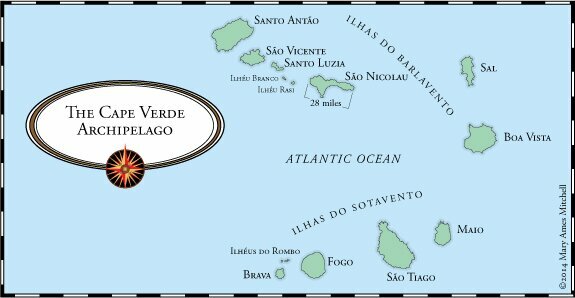 Even though Inventio Fortunatae was about the North Atlantic, Las Casas wrote that the book mentioned the many islands visited by St. Brendan “beyond the Canaries and Cape Verdes” that were “always burning.” Burning islands implied southern waters and volcanoes. Enclosed with his letter, Hugh Say had sent a sketch of Cabot’s map, from which he promised Columbus would learn “what you wish to know, for in it are named the capes of the mainland and islands, and thus you will see where land was first sighted, since most of the land was discovered after turning back.” Yet, even though Hugh Say gave Columbus all the information he needed to find the lands Cabot discovered, Columbus would never sail north. He would have found the mainland of North America if he had. Hugh Say ended his letter telling Columbus to stay tuned. “When I get news from England about the matters referred to above – for I am sure that everything has to come to my knowledge – I will inform your Lordship of all that would not be prejudicial to the King [Henry] my master. Columbus collected the funds he needed for his third voyage from a group of Florentine adventurers doing business in Seville. Three of those men were Francisco Cataino, Gaspar de Spinola, and Francisco de Riberole. Riberole had been a partner in the Canary Island conquest with Columbus’ deceased sponsor Giamotto Berardi. Italian adventurers had become wealthier by investing in the Spanish conquest of Granada, the suppression of the Guanche in the Canaries, and the trade in gold and ivory along the African coast. After the conquest of the Guanche in 1496, they became major landowners of the Canaries. Italians eventually owned 90 percent of sugar production and trade, which was dependent on a strong slave market. As mentioned, when Berardi died in December of 1495, his associate Amerigo Vespucci took over managing their business. First on the docket was a flotilla commanded by Jorge de Sosa. But the latest expedition, which left Seville at the end of January, 1496, fell apart before it crossed the Atlantic. One ship pulled out while sailing down the Rio Guadalquiver. The rest were wrecked in a tempest as they left Sanlúcar de Barrameda on February 3. The Florentines were hoping to be more successful with Columbus. Some of them were also investing in John Cabot’s latest venture. In exchange for their investment in Columbus, the Florentines planned to ship trade goods to Santo Domingo to be sold to the colonists. The ships would return carrying their percentage of Columbus’ profits in gold. Columbus and his six ships left from Sanlúcar de Barrameda on May 30, 1498. Cabot had already departed on his third trip. Vasco da Gama had reached India ten days earlier, on May 20, 1498. Even though it would be a long time before they heard back from Da Gama, the Catholic Monarchs and King Manoel of Portugal were worrying what would happen when Da Gama, who was heading east, ran into Columbus and Cabot, who were heading west. Everyone still assumed they would be meeting up in Asia. How would England, Portugal, and Spain divide the new land claims? That was probably one of the reasons Columbus kept insisting that Cuba was part of the mainland of India. As we already pointed out, if Cuba were part of the mainland, then Spain could claim trading rights with all of the eastern seaboard of Asia where the real riches lay. As far as Columbus knew, Cabot could only lay claim to a couple of islands. Columbus’ ships stopped off in the Madeiras to take on supplies. They reached Pôrto Santo on June 7, and Madeira on June 10. On June 16, the fleet arrived at the Canaries. At the same time, King Manoel was following up on Cabot’s discoveries and sending his own scouts to the North Atlantic to make sure Cabot had not trespassed on Portuguese territory. We will tell you the details about that in the next article. On June 19, Columbus reached Gomera in the Canaries. Just that year, his former lover, Beatriz de Bodallia [who was still acting as the regent for her son, the capitão of the island] married Alonso de Lugar, the fellow who had been in charge of subjugating the Guanche population on her island. You will also recognize Lugar as one of the adventurers who loaned Columbus money for his first voyage. Before leaving Gomera, Columbus’ ships divided into two fleets of three. One fleet headed toward Española. The other fleet, led by Columbus in his flag ship, Sancta Trinidad [Holy Trinity], turned south into Portuguese waters. There are no records that he asked the Portuguese for permission. Columbus was following the promise in Inventio Fortunata of “volcanic islands somewhere beyond the Cape Verde Islands.” The volcano on Fogo island, called Pico do Fogo, rises to almost 10,000 feet above sea level. A Spanish madrigal song described it, “How strangely Fogo burns, amidst an ocean full of flying fishes”. On July 22, a Sunday, the ships “saw innumerable birds pass from the west-southwest to the northeast.” Columbus thought the birds were a good sign of land. “On one day, a pelican came to the ship of the Admiral, and many others appeared another day, and there were other birds which are called ‘frigate pelicans,’” wrote Las Casas. But by July 31, Columbus and his crew were running out of fresh water. They had not seen land for twenty-seven days. Their food had spoiled during the Doldrums. Columbus was desperate. He turned north for the “cannibal islands” he had discovered during his second voyage. Then, at noon that day, a servant named Alonso Pérez Nizzardo, who had been posted to search for land from the top of the rigging [there must not have been a crow’s nest] spotted “three mountains, all at one time and in one glance.” Columbus named the island Trinidad [Holy Trinity]. For nearly two weeks, Columbus explored the area around Trinidad, though he was starting to have trouble with his eyesight, which would eventually blind him, and suffering from gout in his feet. He named the bay to the west Golfo de la Balena [Gulf of the Whale, today’s Gulf of Paria]. He thought it was surrounded by four islands, having no idea he was in the delta of the Rio Orinoco, the fourth largest river in the world(6). However, he did notice the dangerous rip tides caused by the river waters meeting the ocean waters. He named the delta the Mouth of the Dragon. In another document, Columbus wrote, “I believe that this is a very great continental land, which until today has not been known.” He thought he had found the Earthly Paradise, the Garden of Eden that the Bible promised was to be found in the East. He finally understood what the natives on Guadeloupe, St. Croix, and Porto Rico had told him. There was continental land to the south. Was it also true that much gold could be found there? Columbus sailed on to Española and arrived at the end of the summer, only to find the colony falling apart and the colonists revolting against Bartolomé. The chaos would continue for seven more months. 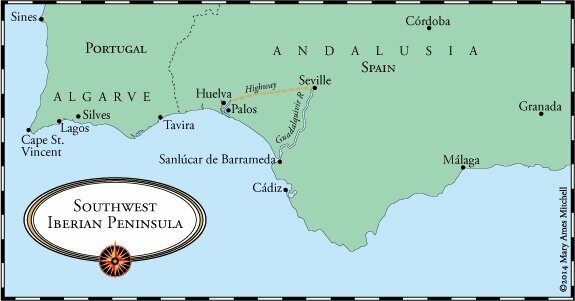 Back in Spain, on March 21, the impatient Spanish Monarchs commissioned Francesco de Bobadilla [the brother of Columbus’ lover, Beatrix Bobadilla] to find out what was going on in Española. It would take Bobadilla another fourteen months to get things in order to leave for the West Indies. Meanwhile, in August or September, Ferdinand and Isabella learned that the Portuguese mariner Vasco da Gama had returned from reaching India by sailing under Africa. Bobadilla reached Santo Domingo on August, 23 1500. He moved quickly. He replaced Columbus with himself as Governor. He ordered Columbus arrested and bound in iron shackles. Then he shipped Columbus, Bartolomé, and Columbus’ son Diogo to Spain. Columbus named the ship after the place where he thought he was, India. The New England settlers did the same thing. They named the first ship they built in North America the Virginia. Contrast two years and one year to the seven years required of the Pilgrims and Puritans who helped build Plymouth and the Massachusetts Bay Colony. The letter written in Spanish by English merchant “John Day” was found in 1956 in the Archivo General de Simancas (Spain). It was addressed to “The Most Magnificent And Most Worthy Lord - The Lord Grand Admiral,” presumably Christopher Columbus. Fernando Columbus’ library contained an abridged Latin edition printed in Antwerp in 1485. Huego is the obsolete spelling of Fuego, the Spanish word for fire. Fogo is Portuguese for fire. The madrigal who sang the song in 1623 was named Thomas Weelkes. According to Douglas Hunter, the Orinoco River is the fourth largest river by volume after the Amazon, the Congo and the Yangtse. For additional sources, see out Sources and Bibliography section.